​If you have a computer or network related problem, Beach PC will get you back running in no time. The friendly service you will receive at Beach PC cannot be matched and they strive to make sure that you understand what needs to be done every step of the way. Tom and Jon are highly knowledgeable and very skilled when it comes to computers and they actually care about their customers. Together, they strive to keep their client's computers running properly and as fast as possible. 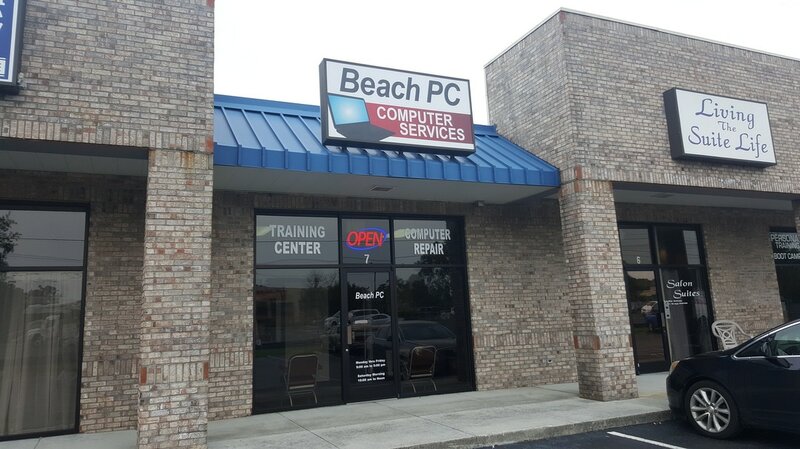 In addition to computer repair, Beach PC also designs and hosts websites for local businesses. As an added service, Beach PC also offers on-site consulting for businesses and residents from Pleasure Island to Monkey Junction. Consulting services include setting up routers for high speed internet, installing CAT5 wiring, and even installing home entertainment systems. Beach PC has proudly served the Cape Fear region of North Carolina since 2005. Our shop is located in Monkey Junction, right next to Strickland's Army/Navy store. If you are travelling from Carolina Beach to Monkey Junction, then our shop is in the small shopping center just past Stricklands. "Momma the Cat" joined our staff around 2011, when we rescued her from wandering around as a stray. Ever since then, she has proved herself to be a worthy addition. She earned her name by presenting us with a new-born kitten, which she brought with her when she moved in. At her suggestion, we gave her kitten away to a good home but kept Momma here in the shop with us!